The Spotted Hyena, Crocuta crocuta, is so named because of the irregular brown spots on a sandy yellow background coat. The young, interestingly, are dark brown, almost black. The Spotted Hyena has a strong neck and forequarters with a sloping back. It is the “Jaws” of the bush, easily able to crack the biggest bones. They are active also at night. Spotted Hyena shot taken by Camera Trap at Marula Boma waterhole. Perhaps the most distinguishing characteristic of the Spotted Hyena is its eerie whooping call – a really typical sound of the African night. When excited they make a high-pitched, almost hysterical laughing sound, and it is sometimes called the Laughing Hyena. 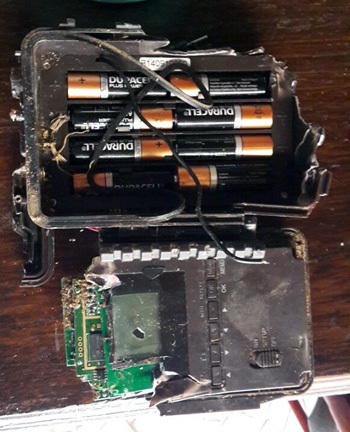 It was certainly no laughing matter when Janneman found the mangled remains of the camera trap at Tremisana Lodge’s waterhole. He thinks it may have been a Leopard. Cracked Camera Trap mangled by Hyena or Leopard. We shall have to attach a new camera higher up a pole. We took all of our guests on an walking adventure – we came across a bunch of cool stuff like black rhinos faeces just out. A little later, another vehicle driver told us to watch out for buffalos not far away and we approached them from a safe distance. We had an amazing view, with a huge gully in between them and us. We had multiple sightings of giraffes on the walk. This month we experienced a huge amount of game in Balule. On one morning I took a lady and her 6 year old son for a long morning drive as they cannot go on the bushwalk. We have been blessed : we started with a huge breeding herd of buffalos right in front of Tremisana Lodge, it turned out it wasn’t only the buffaloes but a pride of lions ( 8 of them ) were hunting the buffaloes, we almost saw a kill. After the lions missed the kill and disappeared in the bush we drove on and saw a Hyena at the incinerator. 5 minutes later we encountered Zulu ( Male Black Rhino ) and one of his wives and kid ( female and calf ), we were as much surprised as they were to find us. I stopped the Landcruiser and let it roll forwards into a more open area where we could have had a better view. Zulu, his wife and kid came charging at us, what an experience !!! I shouted at them and was busy hitting the door of my car, the big metal sound and my voice made them stop about 4 metres away from us with Zulu giving huge snorting noises of him before he ran away. My guests were between scary and amazing feeling, it isn’t every day you get to encounter black rhinos and so close ! On another morning, we knew that the previous night one of our lion pride ( 5 males ) killed a giraffe ( Elias and his very lucky tourists actually saw the giraffe go down the previous night on their way back from Marula Boma ) so I drove towards that direction and find our male lions still busy feeding on that giraffe. Put 5 lions together to hunt it is brilliant but 5 males busy eating at the same time is Total Chaos, everyone is fighting for a small piece. We admired them from a distance, we heard them growling at one another. It was truly AMAZING !! We had some very late rain this month and I ended up going out on a pouring rainy afternoon drive with 4 lovely adventurous ladies. We went to the Landcruiser running under the rain, luckily we were equipped with rain coat and ponchos. Some of the guests decided to remain at the lodge and so I went on with my bravest ladies, they were quite happy about the drive in the rain ! We had excellent sightings of plains game including kudus, waterbuck, zebras and even some giraffes to add to our Impalas. We started by rescuing a chameleon from the road, then we went to the spruit by Rome 1 and found 2 females elephants and their 2 calves, one of the female was busy digging for some water in the sand and cleaning that first water layer, then when the water was clean, her offspring started drinking. We had a nice view because we were a little higher and could see all the hard work from that elephant mum. This month I had what I recall the « good Juju » which is good luck basically when it comes to black rhinos. I had an entire week of finding them. 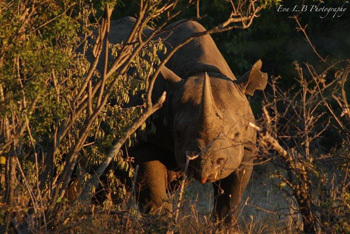 On one of these days, driving towards the beautiful airstrip for our sundowner stop, on our left hand side 2 of our black rhinos offered us a nice and peaceful view of them chewing on some shrubs and bushes as they walked past. After our stop, as the sun set, I took a longest road back to the lodge, we have been stopped by male elephants busy feeding on the side of the road at night time. LOVELY!!! We went out on drive, after discussion with some other guides around I’ve learned that the lions were on Barnard lying down at one of the dams. We went and stopped the Cruiser and had an amazing show from our 5 male lions, all lying down with big stomachs. 1st April : Kruger sightings were difficult but we tried our best : lions at S41 lying down, white rhino Tamboti turn off, buffaloes boom gate, elephants all over and leopard S125. 10th : White rhino before reception, buffalos Rabelais road, lioness before Nsemani dam, a beautiful secretary bird crossing the road before Satara junction, more elephants all over. 24th : Lions on the riverbed after S86 road, leopard on S36 road, buffaloes Talamati road, elephants all over and leopard again up a tree and general game on Talamati road. 28th : A beautiful Black Rhino at Marcs camp lying down and calmly watching us, elephants before Orpen reception, four rhinos near Tamboti camp, buffaloes S41 road, leopard H6 up a tree. April seemed a little quieter than March. The guests still enjoyed everything they got to see. Sunset drives – herd of elephant at the Spruit on Rome 1and 2 white rhinos. We also encountered some buffalo, white rhino and 4 hyenas at Barnards airstrip. 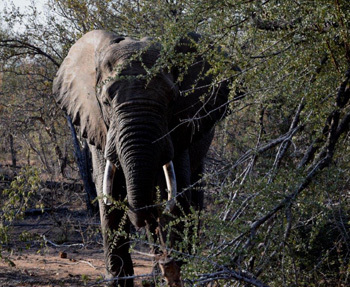 Bushwalks – 1 Bull elephant and 7 hippo and 1 big crocodile at the Olifants river. Also saw a bull elephant at Ezulwini. Also saw 4 wild dogs on the way back on Marula Road – brilliant sighting ! Lioness right in front of Rex’s Landcruiser. 3rd April : On Marula road in Balule – 500m from the fence line on the morning drive we found two wild dog hunting. 4th : On H7 200m from the Orpen boom gate we found a big herd of buffalo crossing the road from Manyeleti to Ngala. 7th : On Olifants road in Balule we found 4 male lions eating a young giraffe next to the road – 1 km from Tremisana Lodge. 8th : Shingamba Dam on Balule we found 4 male lions lying in the grass. 10th : On Marula Road in Balule we found a pride of 7 lions following a herd of buffalo. 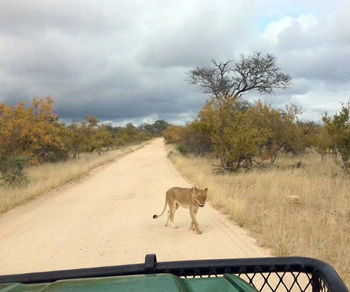 19th : We found 4 lions on Olifants road hunting right at Tremisana Lodge. 23rd : On Rome 1 we found 2 white rhino. 27th : On the S100 in Kruger a big herd of elephant and buffalo -all drinking water. We start our activities with a bushwalk in the morning driving down to Marula road up until we found a good spot to leave the car. While we were driving we saw impalas, grey duiker, steenbok, zebra and giraffes. When we started walking, we saw some waterbuck, hippos and crocodile around the river area then we taught the guests about the beauty of nature, the history of African medicinal uses and we also explained about the small 5 and the different droppings of the animals. On the afternoon drive around Barnards we saw warthog, elephant and kudu. We had rain and the animals seemed to disappear. We also spotted some male lions close to Marula Boma one night. They were eating a giraffe. We saw the giraffe fall. We tried to get closer and saw that the giraffe was still kicking. The guests were very happy about this amazing and very fortunate sighting. On our sunset drive we saw giraffe, kudu, impalas, steenbok and duiker on Sable road. I drove further where we saw black rhino. A female and a young male. It was an amazing experience to see rhinos because they are endangered. We drove down to Marula Boma and saw 2 male elephant and we also heard the lions roar on the southern side. It was amazing to hear and we also heard the jackals. There are amazing sounds around Marula Boma at night. Coming back to the lodge we saw a lot Impala, jackals, zebra and scrub hare. 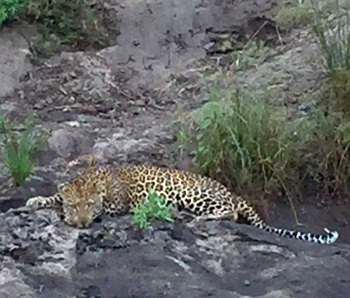 And the best was when we spotted a leopard lying next to the road close to Tremisana Lodge. 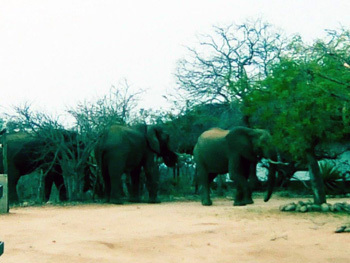 Elephants outside Tremisana Lodge entrance. We had an unexpected, larger-than-life experience right next to the Tremisana Car Park. My guests and I were about to start an early morning bush walk when I noticed a herd of buffalo close to the lodge. I signalled to the guests to stand still while I assessed the situation. I decided that we should take a vehicle to view the herd safely. As we approached in the game viewer, we noticed that there was a pride of lions in close proximity to the herd, across from the main road that passes the lodge. The lions appeared to be observing the herd very closely but they were very relaxed and didn’t seem to be prepared for any form of attack. The herd was aware of the pride across the road. Their behaviour was nervous. They huddled closely together, milling around in an apparent attempt to confuse the pride watching them. However, they stood their ground and made no attempt to flee at this point. As we watched the situation unfold we noticed suddenly that two lionesses were slowly stalking the herd from behind. I then realised that the pride across the road were actually distracting the herd whilst the two huntresses were getting closer and closer. When the two lionesses were about 25m from the herd, a large male buffalo suddenly became aware of their presence, gave an apparent warning snort, took off in a northerly direction (avoiding the pride) and the rest of the herd followed. At this point, the two stalking lionesses joined the pride that began following the buffalo stampede. Curiously, no full-on ambush had been sparked by the fleeing buffalo at this point. The pride followed the herd, but remained relaxed. The whole scene moved further into the bush. We moved on to start our planned bush walk. At the end of our walk, we encountered the same pride still trailing the herd. I explained to the guests that lions will stalk their preferred buffalo prey patiently as they know that an opportunity will eventually present itself to take down a member of the herd. The lions are willing to invest the time following this food source because once successful, the carcass will sufficiently sustain the pride for approximately the next five days. What a sighting we had early in the morning not really expecting that something like this would happen right in front of your Lodge.it is definitely a sighting to remember. On one of the days in Kruger we drove quite a lot but was worth it all at the end of the day. We entered at Orpen gate and 500m down the road we encountered an unexpected sighting of a Leopard on a kill. It was a beautiful male leopard that took down a female Impala and dragged it up into a big Marula tree. The female impala was already half eaten. We also saw Giraffe, Zebra, Wildebeest and a great breeding herd of Elephants which was busy feeding just before Nsemani dam. At the dam we spotted some Hippo relaxing and crocodiles sunbathing. We also saw 5 elephants having a swim and playing, wrestling around with each other in the water – what a excellent sighting indeed which you don’t see every day. After a while of viewing and enjoying the entertainment these elephants gave us we continued to Satara to have lunch where we spot the endangered Southern ground hornbill. After lunch we drove the S27 close to Timbavati picnic spot where we got confirmation that there were some lions lying down relaxing in the shade hiding from the heat of the day. We discovered that these lions had cubs with them – so cute. Afterwards we drove on the S39 next to a beautiful scenic route next to the Timbavati River where we got a herd of 250 Buffalo. Close to the exit, we come across 6 white rhinos. Just before we exit the last Kruger gate we found the leopard again – he had climbed down and was now lying underneath the big Marula tree just looking out over the bush. What a brilliant Kruger day indeed and one which I will never forget !!! NICO WINS REPORT OF THE MONTH PRIZE – WELL DONE YOUNG MAN !!!! This month I am on course and I’ve spent so much time learning about animal behaviour and viewing potential dangerous animals on foot (trails). The course was very interesting as I am doing bushwalk in Balule, backing up with the experience of Rex on most of our bushwalks is vital and brings fun. We had a very beautiful sighting of cheetah next to Tremisana as we managed to get it a minute after starting our sunset drive – how beautiful it is to watch one of the most beautiful cats while the sun sets behind the Drakensberg mountains….…..
Cheetah next to the road at Tremisana. On our way back from Marula Boma, my guests were surprised to see a leopard next to the lodge hunting next our waterholes. It was moving where we had enough light or the big spot light in the guest house shining towards the waterhole. So cheetah and leopard at Tremisana – wow !!! Bushwalk the next day with hippos and crocs in the river, and on our way back we found 4 wild dogs chasing a breeding herd of impalas. As the Wild Dogs approached our game viewer, we noticed that they just finished to kill because they were full of blood on their heads and necks. H1-3 road to Tskowane 3 lionesses before Baobab tree. Buffalo herd drinking water before Mazithi dam. There were more than 50 breeding herd of elephant before Kumana dam. Leopard on the river bed stalking Impala. H7 from Orpen on the way back two rhinos on the T-junction to Maroela Camp. So Big Five again !!!! 12th : S100 two big male lions sleeping under the bushes with blue wildebeest kill. Huge buffalo breeding herd on the S41. 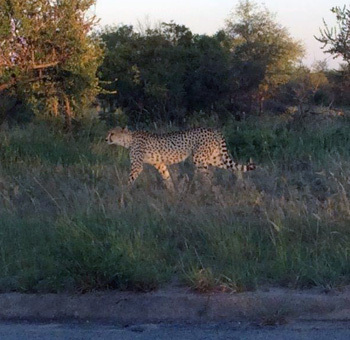 Elephants all over, 4 cheetahs – mother and 3 cubs on H1-4 before S90 road to Olifants. 20th : S41 Nwanetsi road, 16 lions – Lebombo pride with one white lion. Full stomachs. They killed a waterbuck. The Jackals and Hyenas was trying to steal meat from the carcass. Elephant were all over before H-6and buffalo at Nwanetsi bridge drinking. 27th : Five rhinos on H -7. Early morning 3 lion cubs on H-7 before Bobbejaankrans. Breeding herd of buffalos before Phelwane coming to drink water. 2 Crocodiles in the river. 10 Wild Dogs on Rabelais and many elephants everywhere. It has been an incredible experience over the past 8 months since the launch of this unique Sleepout Walking Safaris package. 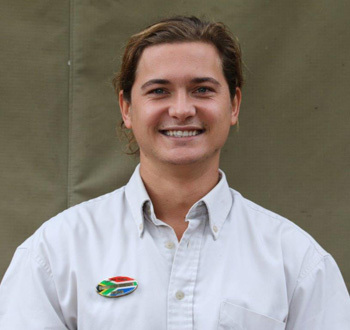 For me, as the ranger, it is the perfect way to really get in touch with Nature and absorb your surroundings – the African bush. To date I have guided over 100 sleepout safaris, and, I must say, falling asleep under the stars with the sounds of hyenas and lions in the distance brings me to a complete point of relaxation. 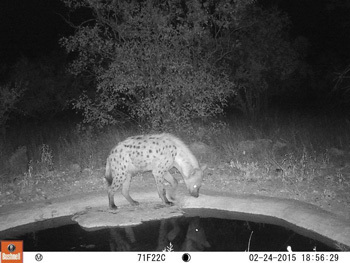 We have also been very lucky having the occasional Hyena, Porcupine and Honey Badger come for a drink by the waterhole. Our walks along the Olifants River have been excellent with the guarantee of seeing hippos and crocodiles almost every day. Due to the drought situation, animals come from far and wide to the river in search of water. Walking along this river system is one of my favourite walking spots throughout the Kruger due to the pure beauty of it. No matter how dry the rest of the bush is, there is always a blanket of green along the river with massive trees – some of them I estimate to be over five centuries old. It has been particularly good to get know all the different guests from across the world as it is a very personalised tour, from sleeping on the decks to watching each other’s backs out on walks. 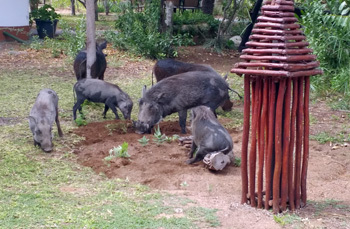 Tremisana: We are saving on lawnmower costs as the Warthogs are doing a fabulous job. Fabulous lawnmowers in action at Tremisana Lodge. Marc’s Treehouse Lodge: We are installing new mosquito nets on all double beds. 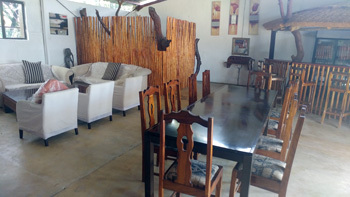 Masango Camp: We have added new furniture and are upgrading all facilities – it is looking really good. Lounge/Dining area and Bar at Masango Camp. Katekani Tented Lodge: We are adding final touches to the last 2 units and will have all 8 luxury tents available from 1 June 2017. My boyfriend and his mum and dad travelled from the UK to experience a safari for my 30th birthday. We had a look at loads of safari tours, but this one was perfect for us. We were picked up from our selected location and had a lovely driver all the way to Hoedspruit. As a South African, I was very impressed with the hospitality, venue and accommodation as I have never done a proper safari trip before. We had an amazing camp leader by the name of Pretty, who was so helpful and kind to everyone there. I would highly recommend this safari tour. We booked a 3 day Safari through Viva Safaris (African Budget Safaris) and our second night was spent at Marc’s Treehouse. The house was more a cabin but very unique. Literally in the middle of the bush. The staff was amazing and even had our place decorated for our honeymoon. It’s definitely a one of a kind place. They offer other accommodations too. Would recommend for a non-traditional, unexpected, pleasant surprise! We loved our stay at Marc’s Treehouse. The coordinator at the treehouse was so friendly and awesome! We had such a fun time. The treehouse we were in was wonderful, safe but still felt like camping! The food was also great! We enjoyed all of our private reserve drives, bush walks, and Kruger day. It was so much fun. We stayed at Tremisana lodge for one night. It was also relaxing. Our room was very toasty and we were supposed to be accommodated in a room of 3 instead of 2 room but other than that it was wonderful. Definitely recommend! We stayed at the tented lodge for five days as we a part of the five day safari by viva safaris. To begin with the place, was amazing, in midst of Kruger this lodge defines simple luxury and one of the best services I have seen in a while. From the manager of the jochen to hi lovely wife , the chef who made everything with his heart and specially making vegetarian options as my wife is a vegetarian to the game guide all were exceptional in taking hospitality to a different level. Coming to the tents they are tastefully done with an indoor and an outdoor shower and a private splash pool which lets you have your private moments with nature surrounding you. The food we ate was the best. The chef had been working in France for over an year and he does cook with his heart. Everyday for meals he would ask your preferences and then cater to them. The manager jochen was just fantastic, taking care of the guests like his family along with his lovely wife as they kept us constantly engaged and providing information about the Kruger national park. The guide who I am sorry I am forgetting the name the lovely lady who took us to Kruger to see the big five also an amazing personality was more than eager to show us the national reserve than probably we were wanting to watch. 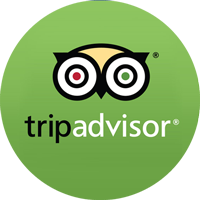 For more reviews, visit us at SafariBookings.